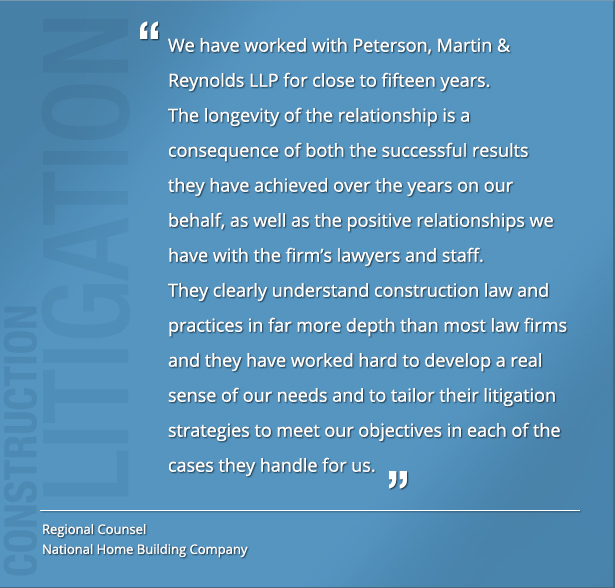 A significant part of our practice at Peterson, Martin & Reynolds LLP covers litigation involving the development and construction of real property. We regularly and successfully represent developers, contractors, owners, lessors and policy holders in numerous disputes related to the planning, design, construction and sale or leasing of commercial and residential property. In doing so, we extensively analyze and apply theories of liability and defense, as well as the measure and extent of damages, and are exemplary in finding the preferred methods of resolution for our clients. To enhance our expertise, we have also developed relationships with an array of leading experts and consultants in the construction field who provide invaluable insight that assists us in zealously representing these clients.